In case you're wondering, the literal translation on the packet is "Extra Large Fat Man Pants"
I'm not quite sure where to begin with this one. 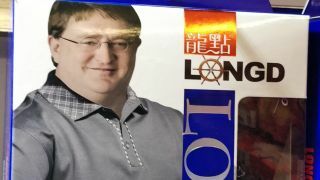 Gabe Newell, co-founder of prolific game studio Valve and steadfast gatekeeper of any Half-Life 3 news, has been spotted in China... on a pair of underpants. Yes, it turns out that one of the world's most famous game developers is also the face of "LongD" briefs, as spotted by a Redditor by the name of ChggnNggts who, quite rightly, took a picture and shared it with the entire internet for public consumption. Check out the full image below, and try to make head or tail of what you're looking at along with the rest of us. The LongD briefs displayed are in the 4XL size, and Reddit has already translated the packaging's text to literally mean "Extra Large Fat Man Pants", or "specially big fattie underwear", depending on the interpretation of the Mandarin characters. And for anyone perceiving this as the beginning of a elaborate ARG that will lead to the announcement of Half-Life 3, well, I've got bad news. The underwear is only sold in packets of two. Even as a salesmen for pants, it seems, Gaben refuses to be associated with the number three whatsoever. Newell himself has yet to publicly respond to the discovery, but suffice to say that we have emailed him for comment, and are eagerly awaiting a reply. Be patient; he's probably just modelling for another LongD photoshoot as we speak. To change the subject somewhat... catch up on the 25 best PC games to play right now, or watch the video below to discover the biggest titles on the way this year.